(1) The thalamus is a mass of nuclei, the most prominent of which are the intralaminar and relay nuclei, that form corticothalamocortical (CTC) circuits with the neocortical hierarchy. (2) The intralaminar nuclei are critically involved in widespread corticothalamocortical (WCTC) circuits that share information with widespread neocortical areas whereas the relay nuclei are critically involved in specific corticothalamocortical (SCTC) circuits that share information with specific neocortical areas. (3) Driven by the signals generated by the brainstem, corticothalamocortical circuits mediate arousal states necessary for memory formation, with wakefulness being the optimal encoding state and sleep being the optimal consolidating state. (4) By stimulating thalamocortical resonance, corticothalamocortical circuits stimulate attention states necessary for maximal neocortical processing and memory formation. (5) Thalamocortical resonance is critical to the formation of permanent memories through synaptic modification. The structure and function of the thalamus are both difficult to grasp intuitively, and it could be argued that less is known about this particular brain structure than any other. Being a small structure heavily interconnected with the neocortex, the thalamus probably punches well above its weight in terms of function. The thalamus is the major structure in the diencephalon, which also contains the hypothalamus, subthalamic nucleus, and epithalamus. The thalamus is a bilobed walnut-shaped structure that lies atop the brainstem. It connects extensively with the neocortex. The thalamus consists of several distinct groups of nuclei separated by myelinated axons called laminae. They are largely classified by their location within the thalamus as well as by their projections to and from other brain structures. The intralaminar nuclei are located in the Y-shaped laminae of the thalamus. They receive inputs from the brainstem reticular formation, basal nuclei, and neocortex, and send outputs to widespread neocortical areas as well as to the basal nuclei striatum (Groenewegen and Berendse, 1994). The relay nuclei are physically separated by the laminae and consist of many distinct subpopulations differentiated by their inputs and outputs (Swenson, 2006). Based on their inputs, they can be classified into first and higher order relay nuclei. First order relay nuclei receive information before it gets processed by the neocortex. They receive inputs from subcortical structures - the optic nerve, inferior colliculus, medial lemniscus, basal nuclei, and cerebellum (Sherman, 2006) - and send outputs to primary neocortical areas. 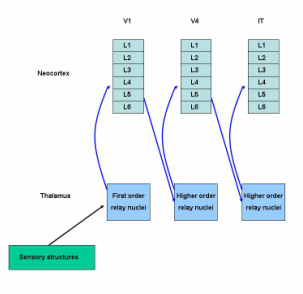 First order relay nuclei include the lateral geniculate nucleus (inputs from the optic nerve, outputs to the primary visual cortex), ventral division of the medial geniculate nucleus (inferior colliculus, primary auditory cortex), ventral posterior nucleus (medial lemniscus, somatosensory cortex), ventral anterior and medial dorsal nuclei (basal nuclei, premotor cortex), and ventrolateral nucleus (cerebellum, premotor and primary motor cortices). Higher order relay nuclei receive information after it gets processed by the neocortex. They receive inputs from a primary or association neocortical area and send outputs to a different association neocortical area (Sherman, 2006). Higher order relay nuclei include the pulvinar nucleus (inputs from and outputs to visual neocortical areas), dorsal division of the medial geniculate nucleus (auditory neocortical areas), and posterior nucleus (somatosensory neocortical areas). The reticular nuclei form a shield against the lateral thalamic surface (Sherman, 2006). They receive inputs from the intralaminar and relay nuclei and neocortex, and send outputs to the intralaminar and relay nuclei. Scattered throughout the thalamus are interneurons, interconnected with the relay nuclei and involved in local regulation. It should now be clear that the thalamus and neocortex are strongly and reciprocally connected. In fact, there is a principle of reciprocity stating that every neocortical area returns fibers to the thalamic nucleus that provides its dominant thalamic input (Diamond et al, 1969). The projections between the thalamus and neocortex form a mass of bush-like nerve fibers within the cerebral white matter called radiations. There are two different types of radiations - thalamocortical radiations project from the intralaminar and relay nuclei and carry signals from the thalamus to the neocortex whereas corticothalamic radiations project from neocortical neurons and carry signals back the other way. Strikingly, there are ten times as many corticothalamic fibers as there are thalamocortical fibers, a massive difference (Hawkins, 2004). Some suggest that the thalamus is primarily a "relay station" for signals to the neocortex, with the corticothalamic fibers playing a secondary role. However, their sheer numbers argue against this and we will see how the signals relayed along corticothalamic radiations play a pivotal role in neocortical prediction. We introduce the neocortex now so as to understand the thalamus. The neocortex is a 2-3 mm thick sheet of 30 billion or so neurons enveloping the rest of the brain that consists of massively repeating neuronal units divided into a hierarchy of processing regions (Hawkins, 2004). In the 1950s the neocortex was proposed to consist of a single massively repeating preserved unit called a column (Mountcastle, 1957), later refined to the minicolumn (Horton and Adams, 2005; Mountcastle, 1978). Each minicolumn is a vertical six-layered unit of 100 or so neurons (Mountcastle, 1997). The top layer consists of neurons with horizontally running axons whereas the lower layers contain neurons with vertically running axons. The neurons in each neocortical layer have different shapes and sizes, and each layer projects to different areas of the brain. The minicolumn is a simple yet striking feature, for every minicolumn is structurally the same as any other which implies that a common neocortical processing algorithm exists across the neocortex regardless of whether vision, sound, touch, or motor commands are being processed (Hawkins, 2004). Some layers are more relevant to the thalamus than others. Layer 1 (L1) contains few neurons but large numbers of dendrites and horizontally running axons; it receives inputs from the intralaminar nuclei. Layer 4 (L4) contains stellate and pyramidal neurons; it receives inputs from the relay nuclei. Layer 5 (L5) contains large pyramidal neurons; it sends outputs to the intralaminar, higher order relay, and reticular nuclei. Layer 6 (L6) consists of a few large pyramidal neurons and many small spindle-like and multiform neurons; it receives inputs from the intralaminar nuclei and sends outputs to the relay nuclei. The world has a hidden hierarchical structure (Hawkins, 2004). Most things in the world, whether concrete, like a tree, or abstract, like a language, are composed of a collection of smaller things, and are themselves part of a larger thing. Like the world, the neocortex is functionally divided into many different processing regions within a neocortical hierarchy, with small-scale relationships stored at the bottom of the hierarchy and large-scale relationships stored at the top. Neocortical areas that receive unprocessed information from first order relay nuclei are called primary areas and are positioned at the lowest level in the hierarchy. Neocortical areas that receive pre-processed inputs from higher order relay nuclei are called association areas and are stationed at various higher levels of the neocortical hierarchy. Since they all consist of near-identical minicolumns, no major structural differences exist between lower and higher areas of the hierarchy; their connections are what distinguish them from each other. Using vision as an example, information from the world is transmitted from eye to optic nerve to thalamic first order relay nuclei and finally to neocortex. The first neocortical area to process the visual information is the primary visual area (V1), the lowest area in the visual neocortical hierarchy; V1 processes visual information in its rawest, most basic form, after which it may be processed further up the hierarchy by higher association areas called V2, V3, V4, V5/MT, and the inferotemporal cortex (IT) (Hawkins, 2004). IT is the last and highest area in the neocortical hierarchy. The hierarchy is not restricted to vision; there are also neocortical hierarchies for other senses such as hearing and touch, and these can all be combined. The thalamus lies atop the brainstem. The thalamic intralaminar and relay nuclei are the most important nuclei and constitute the bulk of the thalamus, but their connections with other brain structures - the circuits - are not shown here, and they are the key. The intralaminar nuclei are located in the Y-shaped laminae. They receive inputs from the brainstem reticular formation and neocortex, and send outputs to the neocortex and basal nuclei. Many of the important relay nuclei are shown here. There are specific nuclei for vision, audition, and proprioception. For visual information, the lateral geniculate nucleus is first order, and the pulvinar nucleus is higher order; for auditory information, the ventral division of the medial geniculate nucleus is first order, and the dorsal division is higher order; and for somatosensory information the ventral posterior nucleus is first order, and the posterior nucleus is higher order (Sherman, 2006). The bush-like radiations are nerve fibers that constitute part of the cerebral white matter, a huge bundle of myelinated axons which largely share information between different regions of the neocortex. In contrast, the radiations share information between the thalamus and neocortex. There are a lot of thalamocortical radiations carrying information from the thalamus to the neocortex, but there are ten times as many corticothalamic radiations carrying information back the other way. The neocortex is a 2-3 mm thick sheet of neurons enveloping the rest of the brain. It consists of a single massively repeating preserved unit called the minicolumn, and it can be divided into a hierarchy of processing regions, called the neocortical hierarchy (Hawkins, 2004). Cross sections of neocortex as drawn by Santiago Ramon y Cajal (Ramon y Cajal, 1899) which can be used to roughly illustrate the concept of the minicolumn. On the left, we have a visual cortex minicolumn; on the right, a motor cortex minicolumn. Both have six layers, and although minor structural differences exist in neuron structure between the visual and motor cortex minicolumns, the similarities are striking. The top layer, L1, contains only a few neurons with horizontally running axons. The deeper layers, L2 to L6, contain many more neurons with vertically running axons. Various levels of the visual neocortical hierarchy. V1 is the first region to receive visual information and the lowest area in the hierarchy. IT is the last region to receive visual information and the highest area in the hierarchy. Since they consist of minicolumns, all areas from V1 to IT are structurally the same, strongly implying that there is a common neocortical processing algorithm. The thalamus and neocortex communicate with each other via corticothalamocortical circuits. Based on the particular thalamic and neocortical neurons involved, there are two types of circuits. The brainstem reticular formation is the generator of many signals to the thalamus which are then relayed back and forth between the thalamus and neocortex by widespread corticothalamocortical (WCTC) circuits. WCTC circuits consist of intralaminar nuclei projections to L1 and L6, and L5 projections back to the intralaminar nuclei (Groenewegen and Berendse, 1994). While the signals in WCTC circuits are sent to widespread areas of neocortex, signals processed by an area of neocortex are returned back to that same area (Llinas, 1998). WCTC circuits are strongly inhibited by the reticular nuclei. Multisensory information is relayed by several sensory structures - the optic nerve for vision, inferior colliculus for audition, and medial lemniscus for proprioception - to the thalamus, which sends it on to the neocortex as an integrated sensory stream carried within specific corticothalamocortical (SCTC) circuits. SCTC circuits consist of drivers and modulators. Drivers relay the sensory stream forward to relevant, specific neocortical areas whereas modulators provide feedback to the sensory stream both from the sensory stream itself as well as from the neocortex; SCTC circuits therefore display feedforward-feedback processing. SCTC circuit drivers consist of relay nuclei projections to L4, and L5 projections back to a different set of higher order relay nuclei (Guillery and Sherman, 2002). Drivers forward the sensory stream to other structures without modifying it (Bosch-Bouju et al, 2013) and thus exhibit feedforward processing. Since they relay the sensory stream from one neocortical area to another indirectly through the thalamus, drivers form an indirect pathway which allows different neocortical areas to communicate with each other through the thalamus, as opposed to the direct pathway which consists of direct corticocortical white matter connections. Thus, whenever two regions of neocortex connect directly to each other, they also connect indirectly through the thalamus (Guillery, 1995; Hawkins, 2004). Surprisingly, although they carry all of the original sensory information, drivers only constitute 10% of all the inputs to the relay nuclei (Van Horn et al, 2000). SCTC circuit modulators consist of L6 projections to the relay nuclei. There are additional modulators outside of SCTC circuits too, such as brainstem reticular formation neurons, the reticular nuclei, and thalamic interneurons (Sherman, 2006). Modulators modify the sensory stream without changing its essential content, mostly by using feedback in which either part of the stream is ¨fed back¨ into the sensory stream at an earlier point, or a predictive signal from the neocortex is fed into the sensory stream. The total feedback signal to the relay nuclei is enormous, with modulators comprising 90% of all the inputs to the relay nuclei - one third of these inputs are from L6, one third are from the brainstem reticular formation, and one third are from the reticular nuclei and thalamic interneurons (Alito and Usrey, 2003; Sherman, 2006). 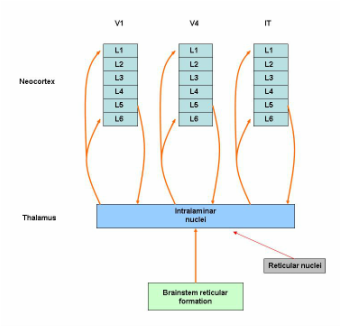 Signals ultimately originating from the brainstem reticular formation are relayed diffusely throughout the neocortex by WCTC circuits which consist of intralaminar nuclei projections to L1 and L6, and L5 projections back to the intralaminar nuclei. Visual pathway SCTC circuits with only drivers shown (blue arrows). Drivers consist of relay nuclei projections to L4, and L5 projections back to a different set of higher order relay nuclei. Visual information from the optic nerve arrives at the first order relay nuclei (lateral geniculate nucleus) where it is integrated into a sensory stream and sent to L4 of V1. It is then relayed back to the higher order relay nuclei (pulvinar nucleus) and sent to L4 of the various higher neocortical areas such as V4 and IT. In this way, the sensory stream is forwarded to other structures in an unmodified form. Visual pathway SCTC circuits with both drivers (blue arrows) and modulators (red arrows) shown. Modulators consist of L6 projections to the relay nuclei as well as brainstem reticular formation neurons, the reticular nuclei, and thalamic interneurons (Sherman, 2006). Modulators modify and control the sensory stream without changing its content, mostly by using feedback in which either part of the sensory stream is fed back into the stream at an earlier point, or a predictive signal from the neocortex is fed into the sensory stream. We mentioned previously that arousal consists of wakefulness and sleep, with the latter consisting of non-rapid eye movement (NREM) and rapid eye movement (REM) sleep. These various states can be measured using an electroencephalogram (EEG) (a device that measures the brain's electrical activity). What the EEG exactly measures is a subject of debate, but to some extent it probably measures the frequency and amplitude of oscillations (back and forth signalling) between thalamic and neocortical neurons which appear as waves on the EEG. The WCTC circuits are central to mediating the transitions between wakefulness and sleep. Wakefulness is maintained by a wakefulness network that may be subdivided into an executive network that stimulates the neocortex directly, and a general network that is the origin of the activating signals (Dubuc, 2014). WCTC circuits, formed from intralaminar nuclei and L5 projections, are the core of the executive network. During relaxed wakefulness, the intralaminar nuclei stimulate the release of the excitatory neurotransmitters glutamate and aspartate at their synapses with L5, maintaining the neocortex in an activated state. L5 returns signals back to the intralaminar nuclei, resulting in corticothalamocortical oscillations. The oscillations in relaxed wakefulness are in the alpha (8 to <13 Hz) range, creating alpha waves on an EEG (Brown et al, 2012); higher frequency waves may appear in states of attention which additionally involve SCTC circuits and will be discussed later. The intralaminar nuclei of WCTC circuits are so critical to wakefulness that even a small lesion affecting them may result in a profound coma (Walling, 2000). In addition to WCTC circuits, the basal nucleus of Meynert and posterior hypothalamus contribute to wakefulness; the former releases the excitatory neurotransmitter acetylcholine, which also inhibits the reticular nuclei (Dubuc, 2014) and is arguably the most important neurotransmitter in wakefulness and sleep regulation, and the latter releases the excitatory neurotransmitter histamine. The midbrain reticular formation, which generates the signals relayed by WCTC circuits to widespread areas of neocortex, is the core of the general network (Brown et al, 2012; Dubuc, 2014). Additional structures in the general network include the locus coeruleus which releases the excitatory neurotransmitter noradrenaline and the raphe nuclei which release serotonin, a neurotransmitter with a dual role; while it supports wakefulness, it also triggers NREM sleep after a period of prolonged wakefulness by stimulating the anterior hypothalamus, which in turn inhibits the wakefulness network (Dubuc, 2014). Thus, wakefulness eventually inhibits itself through negative feedback involving serotonin and the anterior hypothalamus. As wakefulness is inhibited, the levels of excitatory neurotransmitters decline, and the stage is set for NREM sleep. As levels of excitatory neurotransmitters fall, the drop in acetylcholine results in reticular nuclei disinhibition. The reticular nuclei contain sleep pacemaker neurons (Fuentealba and Steriade, 2005) that create slow synchronizing signals dispersed by WCTC circuits throughout the neocortex. The resulting oscillations are in the delta to theta (1 to 8 Hz) range and in the deepest stages of NREM sleep appear as high-amplitude slow waves on an EEG (Brown et al, 2012). These slow oscillations prevent sensory signals from entering the neocortex, maintaining it in an inhibited yet synchronized state with the thalamus (Rasch and Born, 2013). As NREM sleep deepens, most excitatory neurotransmitter levels fall even further and the stage is set for REM sleep. The reduction in serotonin and noradrenaline results in pontine reticular formation disinhibition and the onset of REM sleep. Signals from the activated pontine reticular formation ascend to the intralaminar nuclei to be dispersed throughout the neocortex by WCTC circuits, resulting in alpha oscillations and neocortical activation much like relaxed wakefulness; EEG activity in REM sleep is very similar to that of relaxed wakefulness (Rasch and Born, 2013) and both electromyelography (EMG) and electrooculography (EOG) may be needed to tell them apart; in REM, the EMG will be silent and the EOG will show rapid eye movements. The activated pontine reticular formation releases acetylcholine, which is the only excitatory neurotransmitter maintained at high levels during REM sleep, and excites the occulomotor nuclei and medullary reticular formation, the latter of which projects to spinal motor neurons (Holmes and Jones, 1994). Occulomotor nuclei excitation results in rapid and random eye movements, and medullary reticular formation excitation results in the blocking of spinal motor neurons and near-total body paralysis (Kohyama et al, 1998). The end of REM sleep is followed by either waking or a return to NREM sleep. The wakefulness network consists of both an executive and a general network (Dubuc, 2014). The executive network consists primarily of WCTC circuits, as well as the basal nucleus of Meynert and the posterior hypothalamus; it stimulates the neocortex directly. The general network consists primarily of the midbrain reticular formation, as well as the locus coeruleus, raphe nuclei, and anterior hypothalamus; it is the origin of the signals that generate wakefulness. The EEG in relaxed wakefulness shows an alpha (8 to <13 Hz) background rhythm throughout the neocortex, although in more activated states of attention it may be of a much higher frequency. The EEG in NREM sleep shows a generalized delta to theta (1 to 8 Hz) rhythm throughout the neocortex. The EEG in REM sleep is hard to distinguish from the EEG of relaxed wakefulness. Paradoxically, even though the EEG is similar to wakefulness, the sleeper is harder to arouse during REM sleep than any other stage. The levels of excitatory neurotransmitters change with the state of neocortical activation (Dubuc, 2014). During wakefulness, the levels of glutamate, aspartate, and noradrenaline (top) and acetylcholine (bottom) are high. During NREM sleep, the levels of all of these excitatory neurotransmitters decline. During REM sleep, the level of acetylcholine becomes high again as it is released from the activated pontine reticular formation, but the other neurotransmitters remain suppressed at negligible levels. The transition from wakefulness to NREM sleep goes through several stages of deepening NREM sleep, eventually arriving at REM sleep. Each period of REM sleep is followed by waking or a return to NREM sleep. A hypnogram is a way of easily representing sleep stages as a function of time. A normal night of sleep has several alternating episodes of NREM and REM sleep. As the night progresses, the episodes of NREM are not as deep, whereas the episodes of REM sleep become longer. We now speculate on the mechanism by which corticothalamocortical circuits contribute to information processing. In wakefulness the brain interacts with the world, but the degree of this interaction can be low as in states of relaxed wakefulness, or high as in states of attention. We shall discuss the role of SCTC circuits in neocortical memory prediction before contemplating how corticothalamocortical circuits stimulate attention states. A memory network is an assembly of neocortical minicolumns that stores the essential, invarying characteristics of a particular movement or cognition, including cognitions relating to recognition of things in the world. It is the physical correlate of a memory (a sequence of action potentials that represents the essential, invarying characteristics of a particular movement or cognition). In the case of recognition, a thing recognized by a memory network can be simple, like a wheel, or complex, like a car; we are going to stick to things in only a visual sense right now. Memory networks consist of minicolumns, bound by corticothalamocortical circuits, at one or more levels of the neocortical hierarchy. In the visual neocortical hierarchy, V1 minicolumns recognize only simple things in the visual field; they rapidly change their firing patterns depending upon whether they detect lines or arcs at a spatially specific orientation in a tiny part of the visual field (Hawkins, 2004), whereas V2 to V5 recognize features and objects of intermediate complexity, such as geometric shapes (Pasupathy and Connor, 2001), and IT minicolumns recognize complex things in the visual field, such as faces (Ishai et al, 2005); they maintain a constant firing pattern regardless of spatial orientation or how much of the visual field is involved. 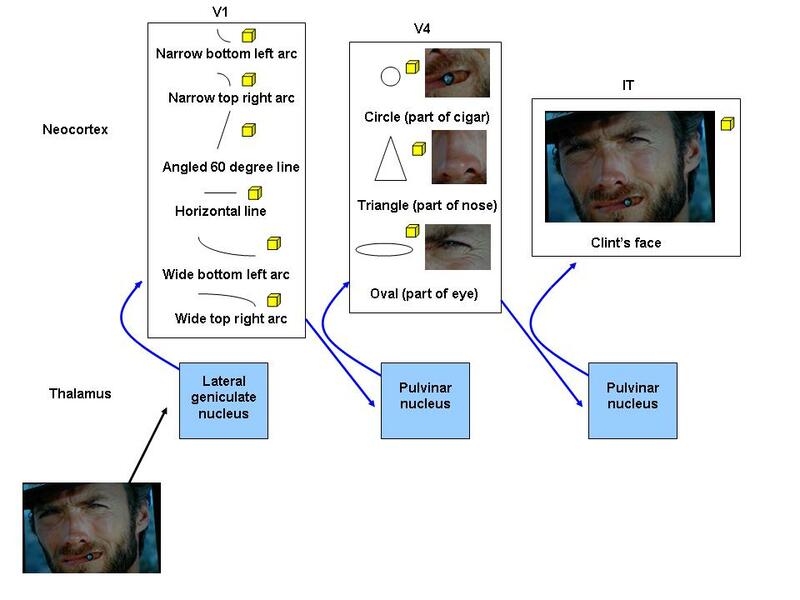 To see how the visual neocortical hierarchy functions, consider the "Clint Eastwood's face" visual memory network, which consists of many minicolumns in all levels from V1 to IT, and what happens as the angle changes as you walk towards him. V1 recognizes only the basic lines and arcs that make up Clint's face, so when you see him, V1 minicolumns fire as they recognize all the little lines that form the borders of his cigar, nose, eyes, and so forth. Since each V1 minicolumn fires in response to a particular angle, different V1 minicolumns fire as you approach Clint from the side to stand in front of him. Moreover, since each V1 minicolumn only processes information from a small part of the visual field, different V1 minicolumns for every small part of the visual field fire as you first notice him out of the corner of your eye and then place him squarely in the center of your visual field. Now consider IT, which combines the information from all of the lower levels to identify complex objects. Since IT minicolumns are specific for complex objects, can tolerate orientation changes, and can process information from the entire visual field, the same IT minicolumns continue to fire in the same, stable manner from when you first recognize Clint, approach him, and stand in front of him. Thus, as your angle changes when you walk towards Clint, V1 firing patterns rapidly change but IT firing patterns remain stable. In memory prediction (Hawkins, 2004), information in the feedforward sensory stream is compared with predictive neocortical feedback along multiple levels of the neocortical hierarchy. 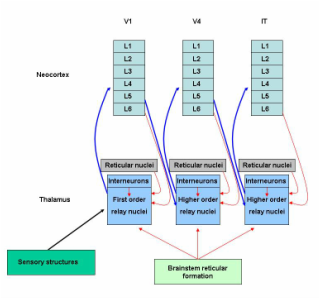 The sensory stream is fed forward along SCTC circuit drivers, oscillating between the thalamus and neocortex as it goes up the hierarchy, while predictions from the neocortex travel down the hierarchy and are simultaneously fed back onto the sensory stream along modulators; the predictions from neocortical memory networks constitute the bulk of thalamocortical processing as evidenced by the fact that there are ten times as many feedback projections from the neocortex to the thalamus as there are the other way. Thus, predicting what is about to occur in the world is the main function of the neocortex; rather than simply sensing and responding to the world, the neocortical memory network inventory forms a model of it that it uses to retrieve memories acquired from past experiences so that they can be combined with current sensory information to make a new, modified prediction about a specific situation (Hawkins, 2004). Consider the example of swinging a tennis racquet. As you swing it, visual information describing where the racquet is and how fast it is travelling is carried up the hierarchy within the sensory stream and fed forward to your neocortex. At the same time and based on past experiences, your neocortex feeds back its predictions about where the racquet should be and how fast it should be travelling; these predictions travel down the hierarchy and feed back onto the sensory stream at every level. If the recent sensory information and the experience-based predictions "match" well enough, your brain will follow through with the swing, using previous experiences plus the specific current sensory information, to make the best swing for that specific situation. If the recent sensory information and experience-based predictions do not match, however - say the racquet suddenly breaks mid-swing and now feels off-balance - the swing may be interrupted as the sensory stream will not match the predictions, resulting in your attention being diverted to the issue. (3) Memory network matching and conversion. As the sensory stream is thalamocortically processed, it is progressively matched (the degree to which neocortical memory networks correctly predict current sensory information from the world) to predictive signals from multiple levels of the neocortical hierarchy. Matching may be good, partial, or poor. In a good match, something in the sensory stream "fits" with the predictive neocortical feedback, meaning that the neocortex has encountered the same or a nearly identical thing before and therefore contains a memory network that recognizes it - since you have swung your tennis racquet many times, you know how to swing it and other tennis racquets well. Since familiar sensory information is quickly matched to the appropriate memory networks, good matches involve little thalamocortical processing as the memory network is rapidly converted (actualized) into a movement or cognition. It is possible for a good match to be made at the lower levels of the neocortical hierarchy, not needing to be processed higher up - if you are an expert at swinging tennis racquets, your lower levels enable you to swing the racquet proficiently while paying almost no attention to the movement. In a partial match, something in the sensory stream does not match as well with the predictions, meaning that the neocortex has not encountered that thing before, but it has encountered things with similar features - you have never swung a baseball bat, but elements of the swing are similar to those of tennis so your brain understands at least something about how to swing it. Partial matches require much more thalamocortical processing, and they also heavily involve the basal nuclei which we will discuss in chapter four. In a poor match, there are no neocortical memory networks that recognize something in the sensory stream, meaning it has never encountered anything like this before and so it is novel - you have never played chess, and your previous experiences swinging tennis racquets help you not one bit. Poor matches also require a lot of thalamocortical processing, and heavily involve the hippocampus which we will discuss in chapter six. (4) Thalamocortical resonance and attention. The thalamus activates when neocortical predictions are to some degree violated by novel or unexpected sensory information resulting in a partial or poor match. It also activates when rewarding or stressful sensory information is encountered, which we shall discuss in later chapters. If neocortical predictions are violated by novel or unexpected sensory information, thalamocortical oscillations increase from the alpha frequencies of relaxed wakefulness into the gamma (30 to 100 Hz) range. What follows is a state of thalamocortical resonance (a prolonged and amplified state of mutual activation between the thalamus and neocortex); thalamocortical resonance may be considered as the hallmark of thalamic function and appears to be maximal at 40 Hz, the EEG frequency detected with active thinking (Llinas, 1998). Gamma oscillations synchronize and temporally bind multiple disparate regions of neocortex together and have been postulated to create a unified perception of experience (Teyler and Rudy, 2007). This physiological unity of many different brain structures by thalamocortical resonance, with the thalamus in the middle of it all, creates a behavioural state of attention (the act of watching, listening to, feeling, or thinking about something that is in some way novel, rewarding, or stressful and therefore warrants further study). Attention states are the optimal states for trying to match partial or poorly matched memory networks, and over time enhance neocortical learning through mechanisms such as synaptic modification which we will talk about in a moment. It has been shown that meditating Buddhist monks can elicit beautiful gamma waves of high amplitudes and ranges on an EEG, whereas the EEGs of untrained meditating students are nowhere near as well-formed (Lutz et al, 2004). Therefore gamma waves, thalamocortical resonance, and attention can be established through both external and internal intreractions. Perhaps these monks trained themselves to enter a powerful internal state of flow, the ultimate state of attention, characterized by complete focus and involvement in whatever task one is engaged in (Csikszentmihalyi, 1990). There is a memory network dedicated to recognizing Clint Eastwood's face in the neocortical hierarchy of most people. 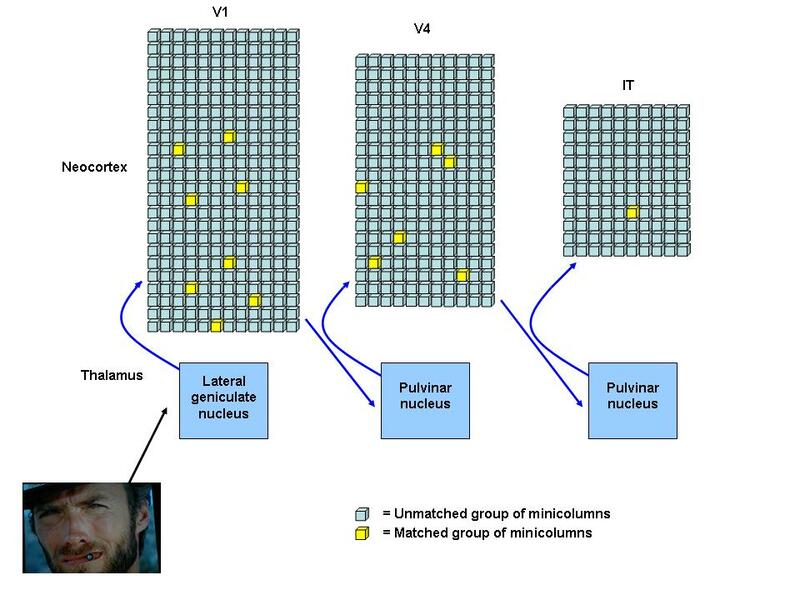 This is a simplified sketch of the SCTC circuits and minicolumns that form the "Clint Eastwood's face" visual memory network; each square represents a small group of unmatched (blue) or matched (yellow) minicolumns. Visual information arriving at the first order relay nuclei (lateral geniculate nucleus) is integrated into a sensory stream and relayed along drivers to V1. Many V1 minicolumns match to the numerous simple and nonspecific attributes of Clint's face, such as the lines and arcs that make up his cigar, nose, and eyes. The sensory stream is relayed back to higher order relay nuclei (pulvinar nucleus) and then forwarded up the neocortical hierarchy. When it arrives at V4, the minicolumns that recognize the basic circles, triangles, and ovals that make up Clint's cigar, nose, and eyes are matched. When the sensory stream arrives at IT, a group of minicolumns highly specific for the visual pattern of Clint Eastwood's face are matched and converted into recognition. This is a simplified sketch similar to the one above, but shows how the simple things matched by lower levels in the neocortical hierarchy may be used to topographically construct a more complex thing. A group of V1 minicolumns will match if it sees a line or an arc in any visual scene, as long as it is the correct line or arc at the correct orientation in the tiny part of visual field that it is responsible for. In contrast, an IT group of minicolumns puts all the information from the lower levels of the neocortical hierarchy together and only matches if it sees the "big picture", and will continue to match and convert into recognition even if the thing it recognizes changes orientation or moves to a different part of the visual field. The swing of a tennis racquet can be used to explain how the neocortex works. As you swing the racquet, visual information describing where the racquet is and how fast it is travelling is carried up the hierarchy within the sensory stream to the neocortex. At the same time and based on past experiences, the neocortex feeds back its predictions about where the racquet should be and how fast it should be travelling; these predictions travel down the hierarchy and feed back onto the sensory stream at every level. If the recent sensory information and the experience-based predictions match well enough, the brain will follow through with the swing, using previous experiences plus the specific current sensory information, to make the best swing for that specific situation. Representation of a functional MRI after a familiar sound detection task (Baars et al, 2013). A familiar sound results in a good match between information in the sensory stream and the auditory memory network specific for that sound. In a good match, the sensory stream may not need to travel far before predictions are sufficiently matched with it, and so consequently only a few memory networks are briefly matched and converted (the blue area). Not much thinking involved. Representation of a functional MRI after a novel sound detection task (Baars et al, 2013). A novel sound results in a poor match between information in the sensory stream and the inventory of auditory memory networks. In a partial or poor match, the sensory stream needs to travel far, all the way up the hierarchy, as some of the information in the stream is novel and cannot be matched to the previous experiences stored within the neocortical memory networks. Consequently, all levels throughout many areas of the neocortical hierarchy are processing the sensory information, trying to find a memory network that can predict things well enough to make a good match. The behavioural correlate of thalamocortical resonance is a state of attention, defined as the act of watching, listening to, feeling, or thinking about something that is in some way novel, rewarding, or stressful and therefore sufficiently interesting enough to warrant further study. Trained meditating Buddhist monks can elicit beautiful gamma (30 to 100 Hz) waves on an EEG, whereas the EEGs of untrained meditating students are nowhere near as well-formed (Lutz et al, 2004). Learning in the brain can occur through several mechanisms, but synaptic modification (Mueller and Pilzecker, 1900) is the most common one and occurs in all brain structures. (1) Long-term potentiation versus depression. The junction between two neurons is called a synapse; the electrical signals, or action potentials, from one neuron are transported as chemical signals, or neurotransmitters, to the next. Synapses are structurally modifiable. If both neurons are stimulated repeatedly and synchronously, synaptic structural changes occur resulting in a long-lasting enhancement in signal transmission referred to as long-term potentiation (LTP) (Cooke and Bliss, 2006). LTP involves four steps. First, the two neurons that form the synapse are stimulated repeatedly and synchronously, as occurs in thalamocortical resonance. Second, additional receptors are recruited by the dendrites of the second neuron over time. Third, more neurotransmitters per action potential are released across the synapse by the first neuron over time. Fourth, long-term potentiation eventually results in structural changes in both neurons, creating a modified, stronger synaptic link between them. Conversely, synaptic links can also be weakened by a process of long-term depression (LTD) (Massey and Bashir, 2007). Since LTP and LTD are opposing forces, synaptic modification is clearly a dynamic process. (2) A common learning mechanism. In this chapter, we have discussed how thalamocortical resonance induces synaptic modification in the neocortex. However, synaptic modification is not solely limited to this structure and has been shown to occur in others including the basal nuclei (Wickens et al, 1996), cerebellum (Wang et al, 2014), and amygdala (Sigurdsson et al, 2007); it has been suggested that synaptic modification may occur at every excitatory synapse in the brain (Malenka and Bear, 2004). Although different brain structures are specialized for different types of learning - the basal nuclei for reinforcement learning, the cerebellum for supervised learning, and the neocortex for unsupervised learning (Doya, 1999) - synaptic modification remains a common learning mechanism in each. In LTP, two synapsing neurons are first stimulated repeatedly and synchronously. Second, additional receptors are recruited by the dendrites of the second neuron over time. Third, more neurotransmitters per action potential are released across the synapse by the first neuron over time. Fourth, structural changes in both neurons have created a stronger synaptic link between them. ﻿The little thalamus mediates arousal and stimulates attention so as to ensure that neocortical memory formation is optimal. Different stages in memory formation require different states of brain activation, and the thalamus conducts those states. Onwards, to the basal nuclei. Alito and Usrey. 2003. Corticothalamic feedback and sensory processing. Current Opinion in Neurobiology 13, 440-445. Baars et al. 2013. Global workspace dynamics: cortical "binding and propagation" enables conscious contents. Frontiers in Psychology 4:200. Bosch-Bouju et al. 2013. Motor thalamus integration of cortical, cerebellar and basal ganglia information: implications for normal and parkinsonian conditions. Frontiers in Computational Neuroscience 7(163). Brown et al. 2012. Control of sleep and wakefulness. Physiological Reviews 92(3), 1087-1187. Csikszentmihalyi. 1990. Flow: the Psychology of Optimal Experience. Harper and Row. Cooke and Bliss. 2006. Plasticity in the human central nervous system. Brain 129(7), 1659-1673. Diamond et al. 1969. The projection of the auditory cortex upon the diencephalon and brainstem in the cat. Brain Research 15, 305-340.Doya. 1999. What are the computations of the cerebellum, the basal ganglia and the cerebral cortex? Neural Networks 12(7-8), 961-974. Fuentealba and Steriade. 2005. The reticular nucleus revisited: intrinsic and network properties of a thalamic pacemaker. Progress in Neurobiology 75(2), 125-141. Groenewegen and Berendse. 1994. The specificity of the "nonspecific" midline and intralaminar thalamic nuclei. Trends in Neurosciences 17(2), 52-57. Guillery. 1995. Anatomical evidence concerning the role of the thalamus in corticocortical communication: a brief review. Journal of Anatomy 187, 583-592. Holmes and Jones. 1994. Importance of cholinergic, GABAergic, serotonergic and other neurons in the medial medullary reticular formation for sleep-wake states studies by cytotoxic lesions in the cat. Neuroscience 62(4), 1179-1200. Horton and Adams. 2005. The cortical column: a structure without a function. Philosophical Transactions of the Royal Society of London B: Biological Sciences 360(1456). 837-862. Ishai et al. 2005. Face perception is mediated by a distributed cortical network. Brain Research Bulletin 67(1-2), 87-93. Llinas et al. 1998. The neuronal basis for consciousness. Philosophical Transactions of the Royal Society B: Biological Sciences 353(1377). 1841-1849. Lutz et al. 2004. Long-term meditators self-induce high-amplitude gamma synchrony during mental practice. Proceeding of the National Academy of Sciences of the United States of America 101(46), 16369-16373. Malenka and Bear. 2004. LTP and LTD: an embarrasment of riches. Neuron 44(1), 5-21. Manni. 2005. Rapid eye movement sleep, non-rapid eye movement sleep, dreams, and hallucinations. Current Psychiatry Reports 7, 196-200. Massey and Bashir. 2007. Long-term depression: multiple forms and implications for long-term brain function. Trends in Neurosciences 30(4), 176-184. Mountcastle. 1957. Modality and topographic properties of single neurons of cat's somatic sensory cortex. Journal of Physiology 20, 408-434. Mountcastle. 1978. The Mindful Brain. MIT Press. Mountcastle. 1997. The columnar organization of the neocortex. Brain 120, 701-722. Mueller and Pilzecker. 1900. Experimentelle Beitrage zur Lehre vom Gedachtniss. Zeitschrift für Psychologie 1(1), 1-288. Pasupathy and Connor. 2001. Shape representation in area V4: position-specific tuning for boundary conformation. Journal of Neurophysiology 86(5), 2505-2519. Sherman. 2006. Thalamus. Scholarpedia 1(9), 1583. Sherman. 2007. The thalamus is more than just a relay. Current Opinions in Neurobiology 17(4), 417-422. Sigurdsson et al. 2007. Long-term potentiation in the amygdala: a cellular mechanism of fear learning and memory. Neuropharmacology 52(1), 215-227. Swenson. 2006. Review of clinical and functional neuroscience. http://www.dartmouth.edu/~rswenson/NeuroSci/chapter_10.html. Van Horn et al. 2000. The relative distribution of synapses in the A-laminae of the lateral geniculate nucleus of the cat. Journal of Comparative Neurology 272, 424-436. Walling. 2000. Consciousness: a brief review of the riddle. Proceedings (Baylor University Medical Center) 13(4), 376-378. Wang et al. 2014. Long-term potentiation at cerebellar parallel fiber-Purkinje cell synapses requires presynaptic and postsynaptic signaling cascades. Journal of Neuroscience 34(6), 2355-2364. Wickens et al. 1996. Dopamine reverses the depression of rat corticostriatal synapses which normally follows high-frequency stimulation of cortex in vitro. Neuroscience 70, 1-5.